You want the perfect sleeping place, which can be set anywhere: in a forest, in a garden, on the beach, on a patio, in the backyard of your home, while camping or to use in the house for guests? That it was warm, comfortable with excellent support for the back when you are lying or sitting? And you want it to be nice to lay together, enjoying the bliss in a hammock? It's very simple! You need a compact outdoor hammock from OZZORO camping! Our love for tourism and diligence in the choice of materials allowed us to create perhaps the best outfitters hammock for camping! Quick hammock setup: in minutes through the use of special, extra durable, long straps and aluminum carabiners. Premium carabiners allow the construction to be exceptionally easy, but still being robust and reliable. We used materials of incomparable quality. Fabric for tent hammock combines the best of quality. How to hang a mobile hammock using hammock suspension system: Installing a two-person Hammock will take you just a couple of minutes. All that is required is finding a place to install, fix straps on poles, and hang the hammock.To fix, simply wrap the belt around the support and thread one end of the strap through the loop, located on the other end. Then we hang the hammock, fixing carabiners in the loops on the straps. Your personal hammock bed is ready! For maximally compact hammock packing during trips or storage there's a compression bag in the kit! 100% Lifetime Warranty from the manufacturer. In fact the best super hammock at an affordable price, book now! 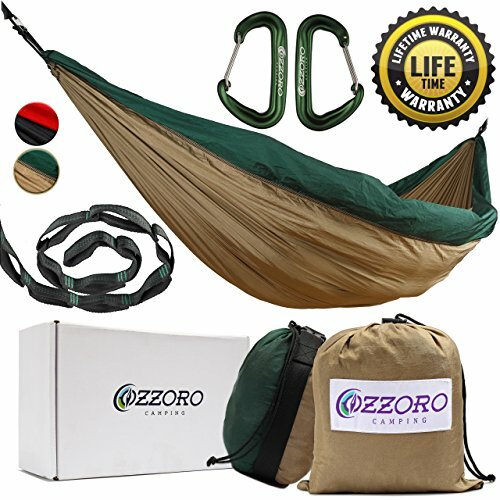 Ordering OZZORO camping hammock, you will get a box with hammock accessories: large hammock, 2 person hammock straps included, hammock carabiners and compact hammock bag. Packable hammocks is suitable for women, man, girls, boys, couples, boy scouts, adults, sports, family, traveler and traveling. And this hammock appears to be your best choice from outdoor gear for backpacking! COMPLETE HAMMOCK BUNDLE - hammock kit includes: Double hammock and straps, hammock carabiners. COMFORTABLE AND HEAVY DUTY HAMMOCK- Our Parachute Hammock is made of ripstop fabric, waterproof 70D Nylon. Each of the 2 Hammock Tree Straps withstands 500 lbs. This high capacity hammock (600 lbs) is a multi person hammock, it is convenient for both: one person and TWO PEOPLE. LIGHTWEIGHT AND PORTABLE HAMMOCK- Is a deluxe hammock to go. Camping Hammock size - 118" (L) x 78" (W), when folded - 6" x 8", weight -1.7 lbs, tree hammock straps - length 115" and 15 loops for adjustable hammock and a triple strong seam for each loop. At the ends of the doublenest hammock, it has strong stitched straps. EASY HANGING HAMMOCK- In less than two minutes, your 2-person hammock is ready for relaxing, thanks to hammock set: Tree Straps and aluminium carabiners! 100% SATISFACTION GUARANTEE & LIFETIME WARRANTY! Our Multifunctional nest Hammock Perfect for hiking, travel, survival, jungle, beach, yard. If you have any questions about this product by OZZORO Camping, contact us by completing and submitting the form below. If you are looking for a specif part number, please include it with your message.